Regional rail operator, Rift Valley Railways (RVR), has partnered with Kampala-based Roofing Rolling Mills in a deal that will see the ferrying of steel by train, easing the burden of the heavy material off the roads. 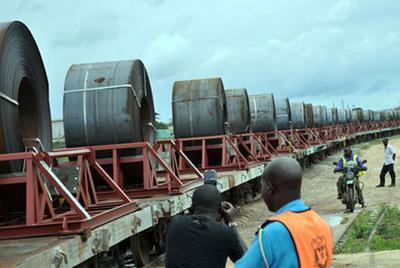 RVR group chief executive officer Darlan de David explained that the pact had been made possible after the firm’s engineers developed specially adapted wagons which firmly secure large steel coils during transit to destinations in Kenya or 1,300 kilometres away in Kampala. “Each trainload using this technology carries an average of 1,000 tonnes of steel, an equivalent of 50 truckloads. This means based on current volumes we’re taking about 400 heavy lorries off the roads per month”, Mr de David said. He added that it was a timely development that would serve the thriving construction industry across East Africa which has seen a surge in steel imports. “This innovation has further social and economic benefit of decongesting roads and reducing the negative environmental impact from dust and fuel emissions, particularly on the busy Northern Corridor,” he said. Roofings Rolling Mills’ executive director Oliver Lalani, said this was a lot more efficient than having many trucks deliver small quantities at the factory intermittently. Kenya National Highway Authority has been complaining of extra loads which have taken a toll on the roads forcing the authority to cut down on the number of axles on the transit vehicles. The required axle load limit in Kenya is eight tonnes. However, some transporters increase the number of axles to carry more cargo. Transporters had been given up to January this year to comply with the law. Those contravening limits will be liable to a fine of $15,000 (Sh1.3 million) and imprisonment of three years at most. In 2012, the East African Community ministers endorsed the 2012 Vehicle Load Control Bill which seeks to harmonise load limit in the region. This followed a row on how much payload member states should allow on their roads. Kenya allows a maximum of 48 tonnes for vehicles, Rwanda and Burundi, 53 tonnes while Tanzania and Uganda allow 56 tonnes, which created hurdles for trucks from neighbouring countries ferrying cargo on Kenyan roads. Trucks from Uganda, Rwanda, Burundi, South Sudan and the Democratic Republic of Congo were often held at weighbridges on Kenyan roads.